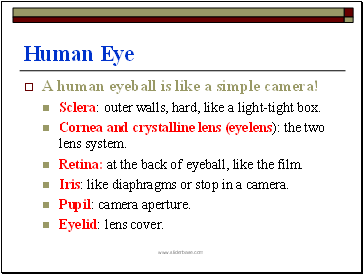 A human eyeball is like a simple camera! Sclera: outer walls, hard, like a light-tight box. 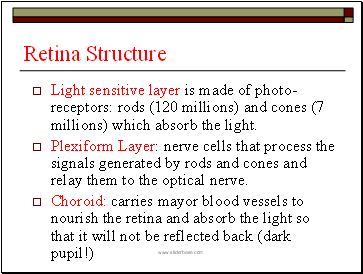 Cornea and crystalline lens (eyelens): the two lens system. Retina: at the back of eyeball, like the film. Iris: like diaphragms or stop in a camera. The space that it inhabits is called the anterior chamber. 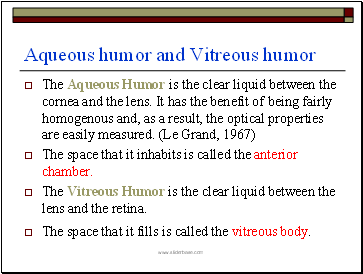 The Vitreous Humor is the clear liquid between the lens and the retina. 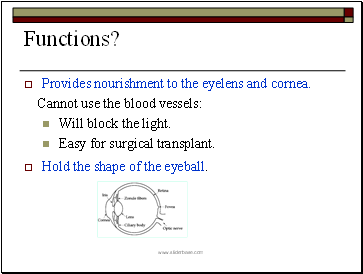 The space that it fills is called the vitreous body. Provides nourishment to the eyelens and cornea. Hold the shape of the eyeball. 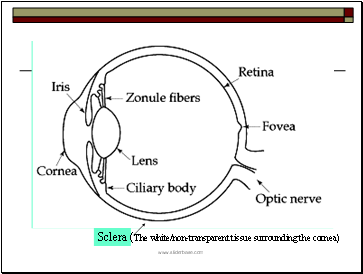 The cornea and eyelens form a compound lens system, producing a real inverted image on the retina. 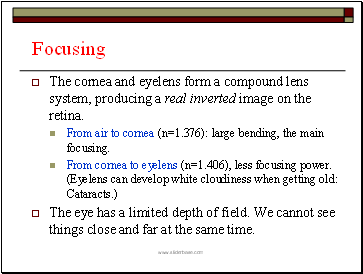 From air to cornea (n=1.376): large bending, the main focusing. The eye has a limited depth of field. We cannot see things close and far at the same time. 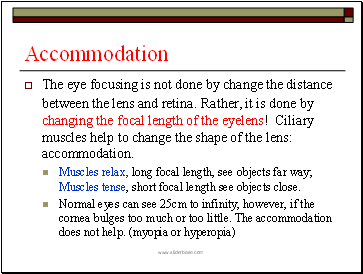 The eye focusing is not done by change the distance between the lens and retina. Rather, it is done by changing the focal length of the eyelens! Ciliary muscles help to change the shape of the lens: accommodation. Muscles relax, long focal length, see objects far way; Muscles tense, short focal length see objects close. When it is full open, it is about f/2 and f/3. This happens at low light level. When the iris has a small opening, it can cut down the light intensity by a factor of 20. 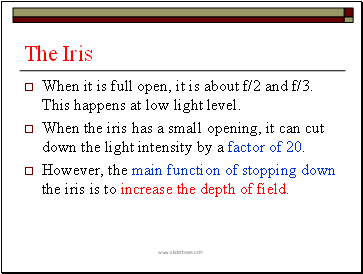 However, the main function of stopping down the iris is to increase the depth of field.